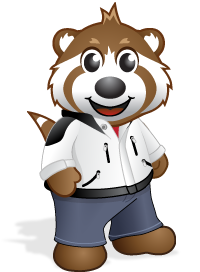 Pandanda - Henry's Blog: Winter Festival Starts Thursday! The Pandanda Winter Festival begins in just 3 days! The Pandanda townspeople are working hard to get their holiday decorations ready. I was checking the Pandanda weather forecast for this week, and it looks like there is a very good chance that we will get lots more snow! I bet it will be just in time for the Winter Festival. During the Winter Fest you will collect stocking stuffers that will appear all around Pandanda, then trade them for awesome Winter prizes. It will be 20 days of Wintery Fun! We've started to get lots of entries in the Festive Photo with Your Friends Contest. You can click that link to read all about how to enter the contest. You have until 11:59pm PST on Sunday, December 18th to email us your pictures. Please make sure to read the rules of the contest very carefully. If your entry does not follow all of the rules, it will not be entered in the contest. Red and Green Day last Wednesday was so much fun! Everyone looked Christmas-y in their red and green outfits. 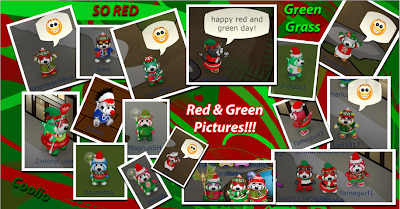 Here are just a few of the pictures that you sent in from Red and Green Day. I'll post some more this week.